The good thing during my grocery shopping is having my hubby with me. He keeps suggesting to pick up things that would help me in my blogging. But always advices me to buy in small quantities so that nothing remains excess and goes waste. He suggests me many ingredients or dishes that he had come across on his outings with his friends. He sometimes go crazy over few things and request to me to prepare them back at home. Last time I remembered he was asking me to make falooda. As an instant fix, I bought a ready mix available in the shop along with that I got a couple of tutti frutti packs for decorating it and also bought an ice cream. Before that, I made these muffins for my cousins during a regular visit to my Aunt's home. My aunt's younger son who is in primary school, asks me for a cake, the moment he sees me. Since the visit was unplanned and considering the time factor, I prepared Muffins to finish the job easier in 20 minutes. The recipe video is available below. 1) Preheat the oven to 180C for 15 minutes. Line the Muffin tray with liners. 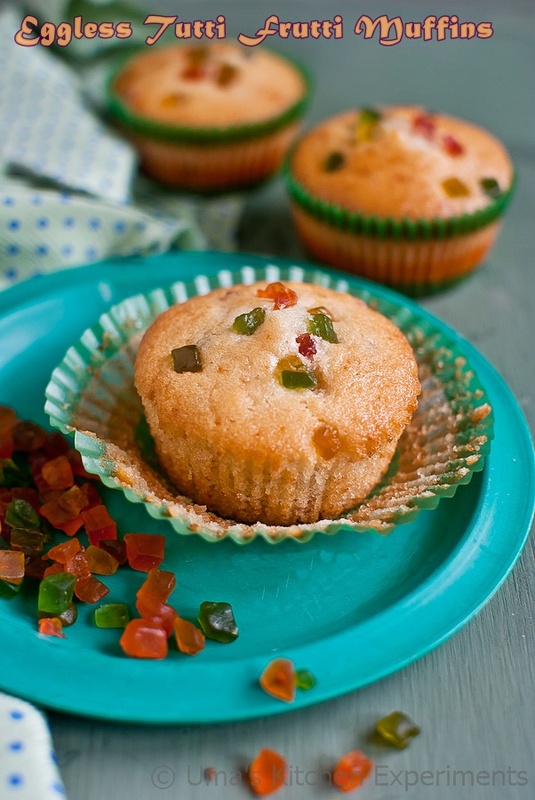 Save some tutti frutti for decorating(topping) and Mix the remaining with 1 tablespoon of all purpose flour. Keep aside. 2) In a wide mixing bowl, mix yogurt, milk and sugar. Mix till the sugar dissolves. 3) Add Baking soda and baking powder. Mix well and keep aside for sometime. After sometime, you can see bubbles in the mixture. 4) Add oil and vanilla essence. Mix it gently. 5) Add flour and continue mixing till u get smooth mixture. Do not over beat. 6) Add the tutti frutti and gently fold it. 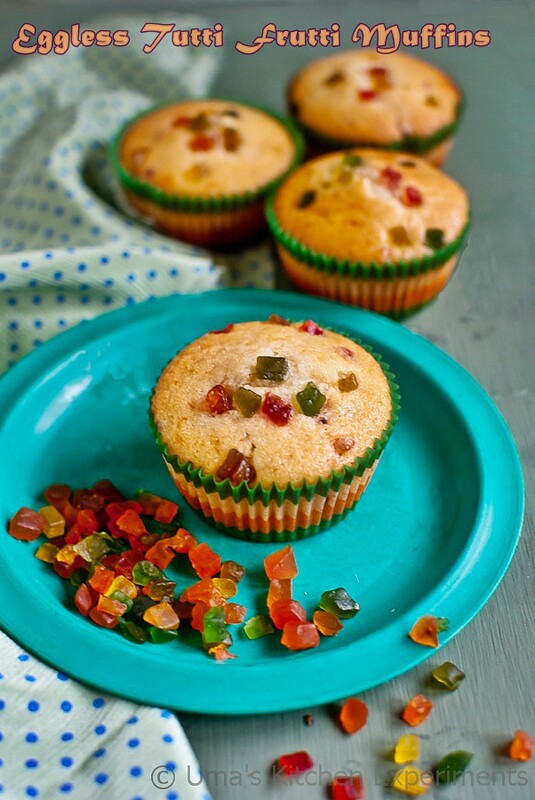 7) Take a tablespoon or more of prepared batter and place it in the muffin liners. Top it with reserved tutti fruttis. 8) Bake it in the oven for 15 to 20 minutes. 9) After 15 minutes, insert the tooth pin into it and if it comes out clean, then the cake is done. 10) Transfer immediately to a wire rack to cool completely. 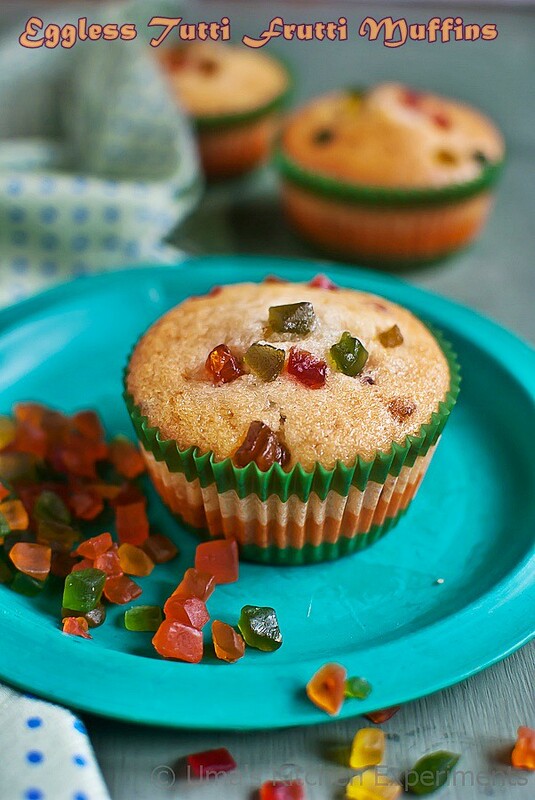 1) Mixing the tutti frutti with the flour doesn't allow it to sink in the bottom of the muffin. 2) Make sure all the ingredients are at room temperature. 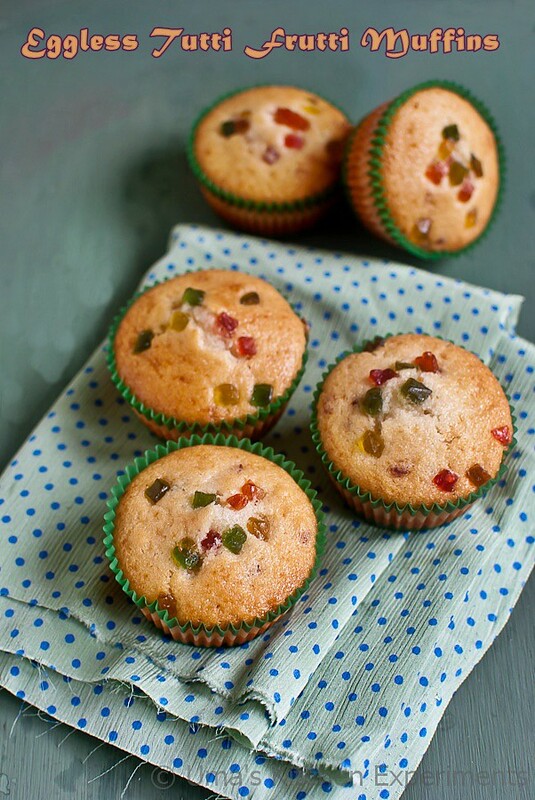 yummy simple but an always hit tutti frutti muffins..no one can say no to these cutties! !